Major Benjamin Tallmadge (Seth Numrich), the sole survivor of a unit of dragoons that was ambushed by Roger’s Rangers, realizes that the British have a spy in the rebel army. 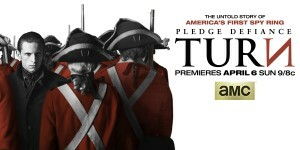 Determined to find the identity of the spy, he recruits childhood friends Abraham Woodhull (Jamie Bell), Anna Strong (Heather Lind) and Caleb Brewster (Daniel Henshall) from his hometown of Setauket to form the Culper Ring in order to smuggle information from British-controlled New York to the rebel army. The community of Setauket is garrisoned by a force of British regulars commanded by Major Edmund Hewlett (Burn Gorman), who has transformed the church of Reverend Tallmadge, Major Tallmadge’s father, into a headquarters and stable for his horse. Unlike the fictional Major Hewlett, the real Colonel Hewlett had fought during the Seven Years’ War (1756-1763), and was a vocal Tory in Queens County, New York during the debates before the start of the revolution. Following the start of the revolution, he raised a militia company of Tories. 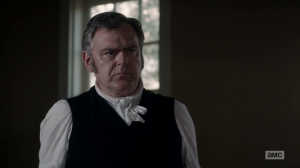 Transforming him into a regular British officer means that the desecration of Reverend Tallmadge’s church could be blamed on the British, not a Loyalist officer. In fact, Loyalist units do not appear in the show, therefore the nasty little civil war that existed in many parts of the colonies is erased, replacing the sizeable minority of Tories with a population composed of people who either were brave and fought or were timid and did not. Oh, goody. There is a tragic romance. I love tragic romances. The relationship between Woodhull and Anna Strong dominates the show. Married to other people, it is clear that they are in love with each other. One of the later episodes reveals that he had broken off their engagement to marry his brother’s bethrothed because he had inadvertently caused the death of his brother, an officer in the militia. Admittedly, the genuine Woodhull did eventually marry, but much later in the war. Ten-years-older than Woodhull, the real Strong was recruited into the spy ring to help the unmarried Woodhull get past checkpoints but there is zero evidence that they had any form of romantic relationship. If she had been an experienced woman who needed a bit of spice in her marriage, that would have been a nice reversal of the usual situation. Instead, it is true love. It is sad that the excuse of romance is needed to give a woman a role in the spy ring. 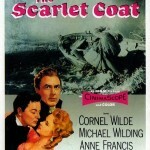 The relationship between Abraham and Anna dominates the show, and Woodhull only helps Tallmadge in order to remove a psychotic suitor from Anna’s life. To be fair to the writers, the real man’s reason was less dramatic. Woodhull had served in the militia under Selah Strong until the Battle of New York, but had to manage the farm and take care of his parents since his two older brothers had already died. Woodhull began to hate the British after his relative General Nathaniel Woodhull was badly wounded when captured by British dragoons. Major Andre was not a ruthless spymaster, paying Robert Rogers and his Rangers to do his dirty work. Robert Rogers became famous during the Seven Years’ War (1756-1763) when he founded Rogers’ Rangers, an early light infantry force that performed special operations, and was the forerunner of the U.S. Army Rangers. When the revolution started, Rogers ended up working for the British, since they made a better offer, and had raised a battalion of 500 rangers, a mix of whites, Indians and blacks, by October 1776. Employing a sloop to move around Long Island, Rogers soon had dozens of informers. 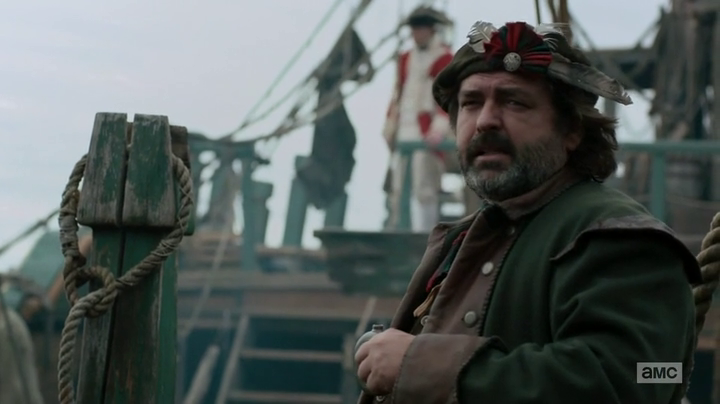 Rogers (Angus Macfadyen) is a brilliant character. Investigating a murder, he reveals a sharp, devious mind. However, his obsession with the hunt for Tallmadge makes no sense. Yes, he constantly comments that Tallmadge had killed one of his men, but it was wartime, it seems likely that other people had also killed some of his men. Yet, he only hunts Tallmadge. Angus Macfadyen has been bouncing around for years, but he never had a project that gave him a chance to shine. To be honest, he does not really shine here, more like ooze, but he steals every single scene he is in. Now I am curious about The Pinkertons, where he plays Allen Pinkerton. 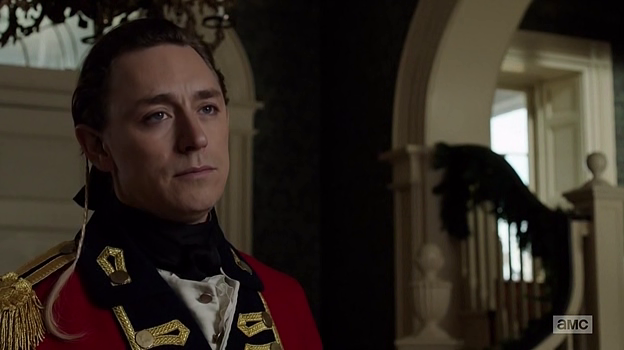 The fictional Major John Andre (JJ Feild) is a much more effective spymaster than the real man. 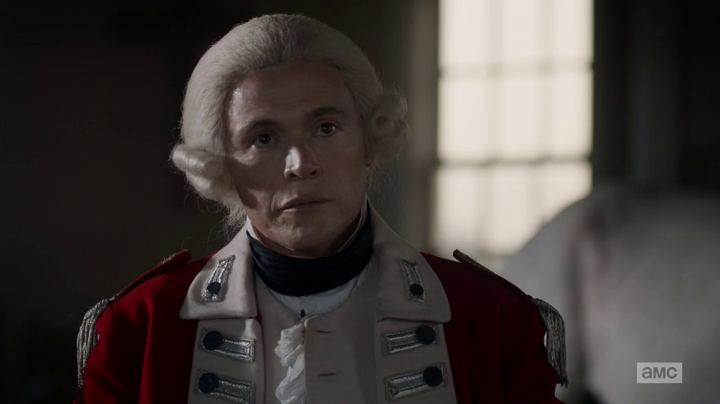 Captain John Andre was appointed the specialist intelligence officer in May 1779, almost three years after the time period on the show. A charming man, he had quickly become a confidant of General Henry Clinton, commander of the British forces in the American colonies at the time, but even Andre himself admitted that he did not have the right character for espionage. Even though it is all made up, the screen Andre is a delight to watch. Again, the events are reversed. Washington recruited Tallmadge, not Tallmadge and several of his plucky friends decided to do their bit for the war effort. After the victories at Trenton and Princeton, the real George Washington was finally able to consider the spy network while freezing at Morristown. Nathaniel Sackett became his spymaster in late January, and Captain Benjamin Tallmadge was appointed Sackett’s military contact. The first recruit was Major John Clark, who spent the period between January and September 1777 on Long Island. Clark protected his agents so well that most are still unknown today. However, Clark was exhausted, so he took a leave of absence in December, and was replaced by Tallmadge. Even though the real Tallmadge’s duties prevented him from taking part in the battles of Trenton and Princeton, he takes Clark’s place in the series. Presumably, the writers worried that the viewers would be confused if there were too many characters. Slavery is shown, but not exactly faced head on. 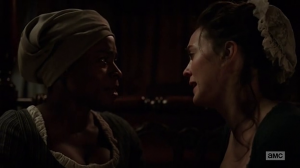 Although both Woodhull and the Strongs have slaves, the show does not dwell on the contradiction of people struggling for freedom while preserving slavery. When Anna Strong;s husband Selah is officially declared a traitor, all of his property is seized by the crown and his slaves are freed, based on Dunmore’s Proclamation. On November 7, 1775, John Murray, Earl of Dunmore and royal governor of Virginia, issued a proclamation that promised freedom to the slaves of rebels who fled their owners. Protesting the liberation to the major, Anna actually says that it is cruel because those poor souls have never had to provide for themselves. Responding that slavery is a sin, the major has little sympathy for her. Apparently, Anna treated her housemaid Abigail (Idara Victor) well because she is willing to continue to work for Anna, but she is sent to Major Andre. So the only slave owner shown is loved by her possessions. Simcoe after he stabbed a man during dinner. 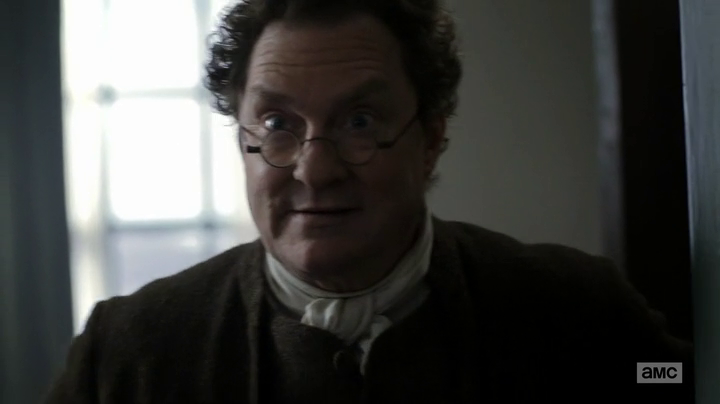 Captain Simcoe is a nasty, nasty, nasty man. I admit that I initially thought that Captain John Simcoe (Samuel Roukin) was a caricature since he is such a beast, but apparently the real man was extremely unpleasant. Some British officers had barely contained homicidal instincts, and would beat civilians at the slightest hint of disrespect or simply if a merchant demanded full payment. Simcoe was one of the most vicious. Some parts of his character are based on facts, but altered to fit the show. 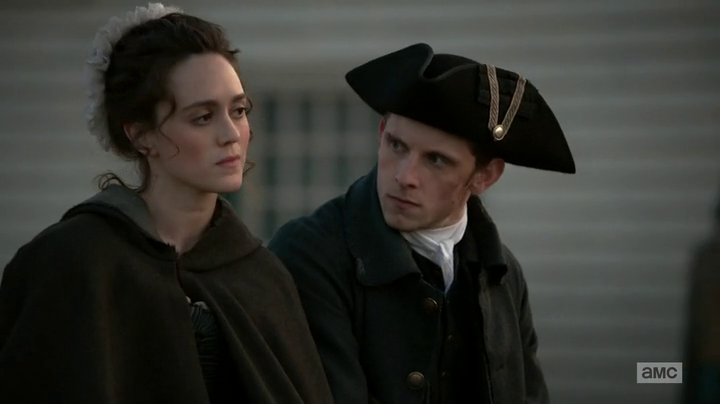 Simcoe moves in on the lovely Anna Strong, while the real man targeted a relative of Robert Townsend, which drove Townsend to become one of Tallmadge’s agents. Although the writers made many drastic changes to the characters to fit the needs of the story, the overall history is okay. Early in the series, Tallmadge’s superior explains that they have no friends in New York since Washington burned it to the ground during his retreat, which is not exactly true. A fire broke out while the rebels were retreating and destroyed roughly a fifth of the city, but it was not intentional, since Washington had rejected his generals’ suggestion that he torch the city to deny it as a base for the British. 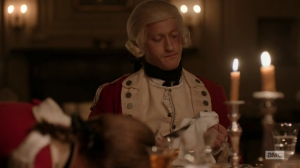 The show correctly points out that everyone on both sides thought that George Washington (Ian Kahn) was finished in early December, since most of the rebel army had been destroyed, and the remainder of the army would evaporate on New Year’s Day because the soldiers’ enlistments will have expired, thus ending the war. While the presentation of Washington’s crossing of the Delaware and victory at Trenton is accurate, General Cornwallis’ attempt to trap Washington at Trenton is altered to make Andre look more effective. 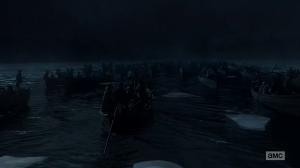 Ignoring Andre’s recommendation to attack even though it is nearly dark, the fictional Cornwallis waits until daylight, allowing Washington to slip away in the night, leaving a small force to light enough fires to look like the army. The real Cornwallis had tried three times to break through the American defences, and only stopped when it was dark, so it is unfair to show him as an indecisive bumbler. The writers are in a hurry. 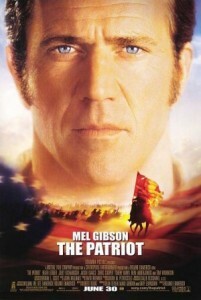 Partway through the series, General Charles Lee (Brian Finney), second-in-command of the rebel army, is revealed as Andre’s informant, after Andre uses a female agent to lure him into a trap. Dismissing Lee’s value as an informant, Andre has a bold plan to capture Lee, wait until half of the army refuses to re-enlist during the winter, and arrange for him to escape. Congress will undoubtedly replace Washington with him, and then he will advise Congress to sue for peace. An intriguing plan, but a lot of ifs. The show’s portrayal of Lee is very unfair to the real man, who believed that he, not Washington, should command the army, but was committed to the Patriot cause at the beginning of the war. Admittedly, the view that Lee was a traitor has some basis in reality. Captured a couple of weeks before Washington’s victory at Trenton, the real Lee did prepare a plan for General Howe to reconquer the colonies, but that may have been an attempt to avoid execution since he had not officially resigned from the British army before accepting a commission with the rebel army. Following his release, his rapid retreat during the Battle of Monmouth Courthouse (June 28, 1778) suggests that he may have been turned during his captivity, but there is no evidence that he was preparing to betray the rebels even before he was captured. It is odd that Lee’s capture by the British is never mentioned by either side on the show, since Lee was more feared by the British than Washington, so his capture was quite a coup. The Culper Spy Ring was the first modern spy ring. One of the best parts of the show are Sackett’s (Stephen Root) lectures to Tallmadge about dead drops and encryption. The real Sackett designed a surprisingly advanced spy system, where civilians posed as British sympathizers to forge connections with loyalists in order to gain more access to the British military. However, there was no need to introduce modern concepts like safe houses and black budgets. When the spy ring is first formed, General Scott is repulsed at the notion that Washington will lie to Congress to obtain the funds needed to pay huge bribes to acquire information. Staffed by volunteers who only wanted their expenses reimbursed, the actual spy ring was surprisingly inexpensive. Washington’s complete budget for the spy ring throughout the entire duration of the war was a total of less than two thousand pounds, while the British were spending a thousand pounds a month near the end of the war. The idea of opening an episode with an enactment of a failed espionage method to show how Sackett was wrestling with different ideas was quite innovative, but sadly, it was only done once. 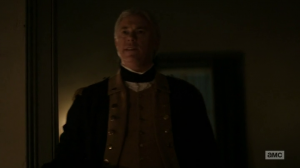 The debate between General Charles Scott (Michael Gaston) and Tallmadge over scouts vs spies did take place, and soldiers did make bad spies since they were unable to blend in like civilians. The genuine Tallmadge valued secrecy in order to create a network of agents but Scott wanted to stick to traditional methods, sending an agent across enemy lines for a few days to obtain immediate information. After the British captured several of Scott’s agents, Washington made Tallmadge head of the spy network when a frustrated Scott resigned. The screen Scott is treated badly. If the series had shown the capture of any of Scott’s agents, the viewers would have understood that his methods did not work. 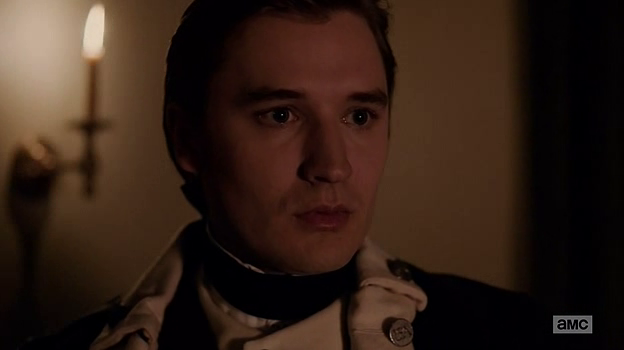 Instead, he is simply a strict disciplinarian, who seems fixated on court-martialing Tallmadge. The show has some strengths, not many, but some. It is a nice touch that Abraham Woodhull spies for the rebels even though his father, Richard Woodhull (Kevin McNally), is the local judge and a Loyalist. Actually, the real man’s father was neither a judge nor a Loyalist. Despite the change, the judge’s often difficult position of mediator between the townspeople and the occupiers is interesting. 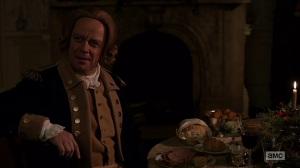 The episode where Major Hewlett demands that ten families donate headstones for the garrison’s defense was one of the few episodes to show the interactions between the little factions in the town. If the whole season had been like that, it would have been a good season. The show hints at what it could be. At one point, Strong petitions for her husband’s release and accuses the magistrate of sentencing him on hearsay that he was a delegate to the provincial congress just to seize his land and divide it among his friends. It turns out that this is not a baseless accusation. During a dinner hosted by Andre, one of the commissaries reveals that they obtain land cheaply by simply declaring the owners rebels and seizing the land. Unfortunately, scenes like that are rare. While the series focuses too much on Woodhull’s romantic entanglements, it is an interesting look at the American Revolution.